I took this photograph on a leisure trip to Somerset. In spite of it being on my third-string camera – a very old one – I am quite pleased with the result. The image is processed into black and white and the exposure and contrast levels are adjusted to create a slightly unworldly quality, perhaps befitting the metaphysical message of the building itself. I am interested in all kinds of art and photography, but there is something about the skill and endeavour of architecture, and the ways in which it serves not only as a functional structure but as a deliverer of values and messages, that keeps it, for me, endlessly fascinating. 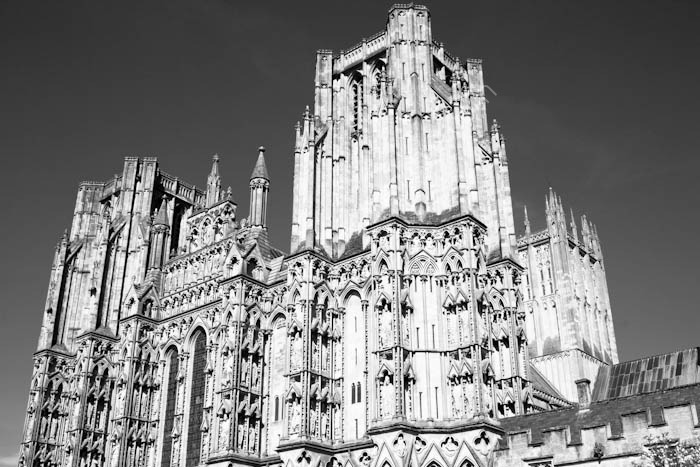 Building began on Wells Cathedral in 1175 and the first phase took about 80 years to complete. The main structure and Chapter House were completed in 1306. In short, no-one lived to see the whole enterprise, such was its scope. Many of the alcoves on the front have lost their effigies of saints. One might tend to put this down to the iconoclasm of the Reformation era. However, the cathedral did not fare as badly as some equivalents in that era, but it then sustained further damage during the English Civil War.